Wow, I’m so grateful to be dry and warm, this day was really rough weather wise. Started out being quite nice, I had to wipe the tent twice in the morning due to a short rain shower, yet then I could start the hike just shy of 9:30 wearing my ordinary hiking pants. About an hour later I changed into rain gear and that was it for the day. During a short coffee break in Kaitumjaure cabin, I learned that the forecast promised random rain showers throughout the day. That didn’t sound too bad and I continued in the direction of Hukejaure, leaving Kungsleden behind and finding my trusted reindeer tracks on the mountainside. Shortly after I left the cabin the rain started falling again and then only stopped for briefer periods of time. Additionally, the wind was really strong and actually pushed me around at times, which is alright when hiking on solid ground, though it gets a little sketchy when on loose and wet rocks. 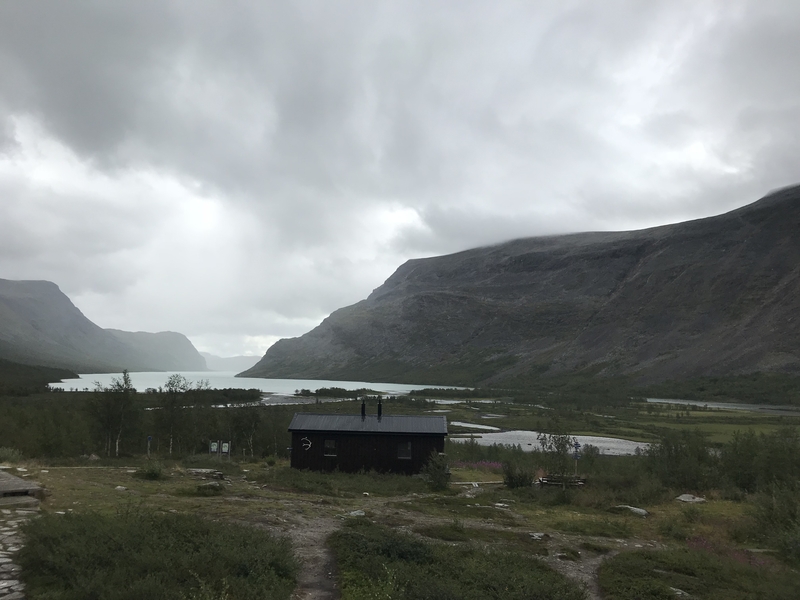 I hiked north pretty high up on the mountainside parallel to Kungsleden until passing a group of beautiful small lakes on my right and then turning westward into Sanarvaggi. Now the wind hit me straight head-on, making it impossible for even the best rain gear to keep me dry. It was a relief to reach Viddjajavri and turn northbound again along the shore. My original plan was to reach Ruskajavri and camp at one of the sites I spotted last year, though when I was on the north end of Viddjajavri I saw a suitable spot of grass while the rain had lessened to almost nothing at all. Unfortunately, it picked up again soon after I started to raise the tent and I had to accept getting the inside wet before managing to get the rain fly in place. Because of my wet backpack and rain gear, I also pitched the gear shed, hoping to manage to dry the inside of the tent and keep it dry after that. After a few cups of hot tea, dinner, and coffee while covering myself with the sleeping bag, everything looks and feels a lot lighter. Though the rain continues outside and the wind still shakes the tent at times. We’ll see what tomorrow brings, whatever comes up I know I go to Hukejaure.